Research is being done on drought tolerance and sorghum. California Ag Today recently spoke with Jeff Dahlberg, director of the Kearney Agricultural Research and Extension Center in Parlier about the topic. “The sorghum research has gone pretty well for the drought tolerance; we have just finished publishing our fifth article on their first year of data,” he said. There is a lot of interest in the research findings developing through all the drought work. California is a unique spot to do drought work on a field scale because it does not rain very often. “That allows us to basically control the field through our ability to add water whenever we want to. I’m really excited about this,” Dahlberg said. There are genes that are turned off and on with the application and/or lack of water. “The challenge for us now is to start taking all this data and trying to make some sense out of it,” Dahelberg explained. It is critical to find out which genes are needed for drought tolerance and how they can get them expressed in plants. “I think this is long-term basic research but has long-term implications in our ability to produce more drought tolerant crops to help feed the world,” Dahlberg said. Sorghum has a long-standing history in California. It was grown here in the late 1800s. The USDA brought sorghum to California as a drought-tolerant feed. “In the 1960s, there were almost 400,000 acres of grain sorghum grown in the state, primarily as a rotation crop for cotton,” Dahlberg said. This crop is making a come-back with all of the droughts California has been going through. “It’s a very drought tolerant crop. Probably one of the most drought tolerance cereal crops that we grow worldwide,” Dahlberg explained. California Ag Today recently spoke with Mark Mariani, executive chairman of the Mariani Packing Company in Vacaville and outgoing chairman of the Safe Food Alliance, which recently opened a new laboratory in Kingsburg to provide further research into food safety. “We’ve been members since 1946, and the fact that the produce industry is self-policing is very unique,” Mariani said. “The reason why we enjoyed the DFA and now the SFA is the fact that we are very concerned about food safety and so we are in a very unique industry in the sense that we self-police ourselves and so this is not something new. We’ve been doing it for over 100 years,” he explained. With all the clamor that glyphosate herbicide is a cancer causing material, let the facts tell the real story. Liza Dunn is an emergency medical doctor and also a medical toxicologist on the faculty at Washington University in St. Louis. And she’s also been working with Monsanto on anything that could show that glyphosate herbicide could not be safe when used correctly. She discussed a robust study showing no evidence that glyphosate is cancer causing. None! “The Ag Health Study is a study of more than 57,000 farmers with their pesticide applicators, and they had followed them since the mid ’90s to look at effects of pesticides exposure. And one of the pesticides that they’ve looked at is glyphosate,” Dunn explained. “In 2005, there was even a journal article that demonstrated that there was no association between glyphosate in any kind of cancer whatsoever. That data was refreshed in 2013, and once again, the data demonstrated unequivocally that there was no association between glyphosate and any kind of cancer,” she said. However, that second set of data was never published. “That was in 2015, and why the research was not published is beyond me,” Dunn said. According to her, IARC is going completely in the wrong direction. “The IARC have gotten much more involved in looking at things that are not carcinogens, and out of abundance of caution, I guess – I’m not sure what their motivation is – they’ve decided to classify them as carcinogens anyway,” Dunn said. 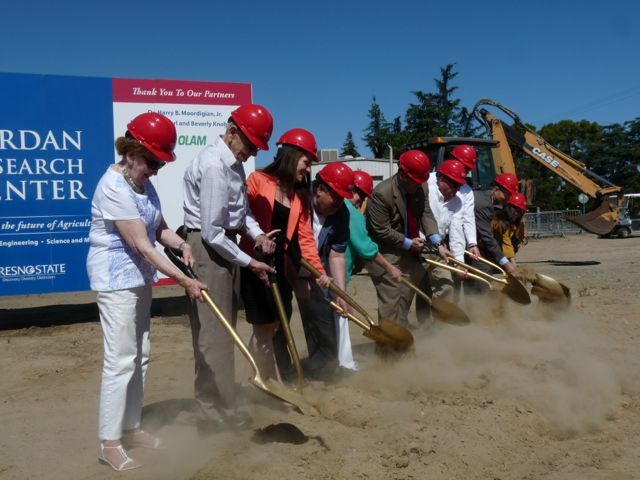 Under clear blue skies, with hundreds of agricultural industry members in attendance, the Jordan College of Agricultural Sciences and Technology at Fresno State broke ground yesterday on a new 30,000 sq. ft. Jordan Research Center, at the corner of Barstow and Woodrow Avenues, designed to foster collaboration among students and faculty in agricultural sciences and technology engineering and science and mathematics. The new research center of Fresno State is scheduled to open in the fall of 2015. Fresno State President Joseph I. Castro said the world-class Jordan Research Center would provide many opportunities for students. “We are very excited about the Jordan Research Center. It’s going to provide many new opportunities for the next generations of leaders in agriculture, advance the research throughout our region and play a key role in strengthening our economy here in the Valley,” Castro said. The monetary gift is the largest cash gift in Fresno State’s history and among the largest ever in the CSU system. 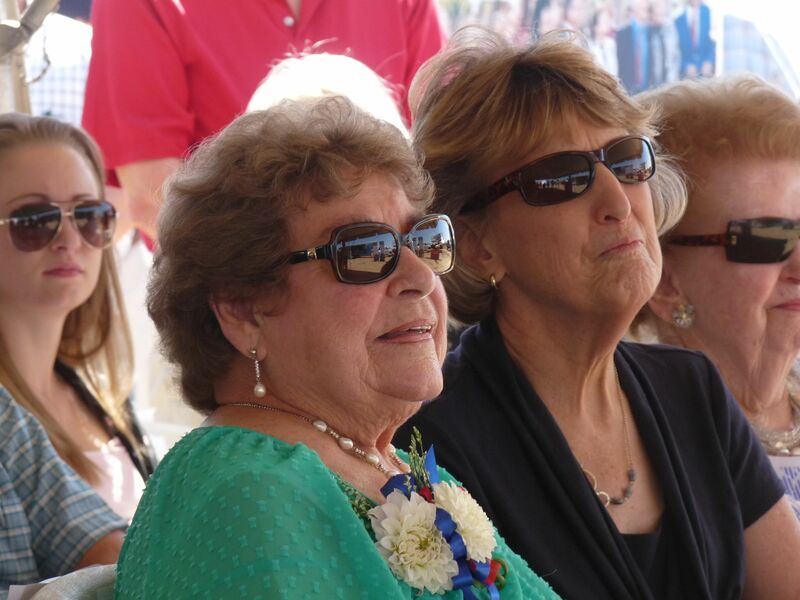 “My late husband Bud, as well as brother-in-law Lowell, would be so very pleased to see not only the family legacy tied to Fresno State agriculture, but to know that the future of agriculture will be well served by the work to be done in the research center,” said Dee Jordan. Retired Fresno Dentist Harry Moodigian, who walked onto the Fresno State campus in 1956, has given $200,000 in support of a microbiology lab at the center. “I want to see my University in the forefront of research in the field of microbiology. This is a wonderful way of supporting the research program. And, Dave Watkins, senior vice president of agricultural operations for Loam Spices and Vegetable Ingredients has established a $200,000 endowment to support the interdisciplinary research lab. “We moved our headquarters to Fresno three years ago, and we immediately began reaching out to the University to build our relationship, established an intern recruiting program, and when this opportunity came along, it was a perfect fit for us,” said Watkins. Alumni Earl and Beverly Knobloch gave in support of the instrument/robotics laboratory space. This $24 million project will feature open, flexible space designed for collaborative research. Faculty and students from the Jordan College will work alongside colleagues in the Lyles College of Engineering and the College of Science and Mathematics. “This is the first-of-its-kind on a CSU campus. Fresno State agriculture will be on the leading edge as we continue to make significant contributions to enhancing production agriculture, food systems and natural resources,” said Dr. Charles Boyer, dean of the Jordan College. The state-of-the-art center will include wet and dry laboratories and laboratory support space. “For our students, the Jordan Research Center will create an environment where research becomes totally integrated into university life. This will be a place where the region’s greatest minds will enrich our environment and unlock the solution for our greatest challenges,” Boyer said. For more information, contact Shannon Fast, associate director of development for the Jordan College, at 559.278.4266 or sfast@csufresno.edu. To discuss potential partnership opportunities in the Jordan Research Center, contact Alcidia Freitas Gomes at 559.278.4266 or alcidia@csufresno.edu. What academic or worldly discipline – geography, sociology, biology, chemistry, economics, politics, psychology, medicine – or realm of life – will NOT be affected?